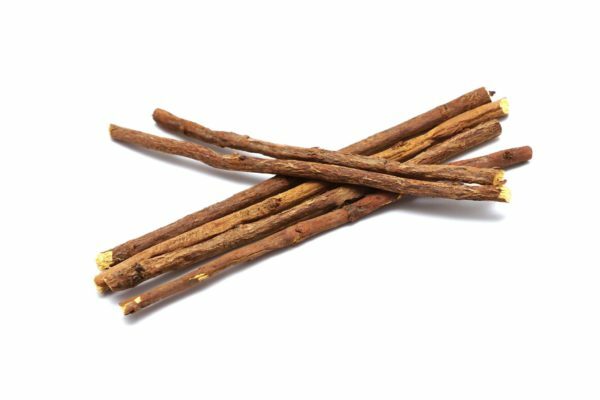 You may have enjoyed it as a child in candies, but did you know that licorice root is also great for skin? A treasured natural remedy for a number of health issues, licorice has only recently been discovered as helpful for people with sensitive skin, as well as to lighten and brighten your skin's look. Who knew this plain-looking root could be so useful? Licorice is the root of a plant called Glycyrrhiza glabra, a legume related to beans and peas that is native to southern Europe and parts of Asia. It likes well-drained soils with full sun, and is harvested about two-three years after planting. A perennial, it grows to 3-7 feet high, with feather-like leaves 3-6 inches long and purple to pale whitish blue flowers. The fruit is small—only about 1 inch long—with several seeds inside. The root is what's typically used for both its health benefits and skin care benefits. The extract is produced by boiling the root, evaporating most of the water, and saving the remaining syrup. A compound in the syrup called “glycyrrhizin” is a sweetener considered to be much sweeter than sucrose, which also has health benefits. Licorice root has been used historically for a number of ailments, including asthma, fatigue, depression, colds and flu, gingivitis and tooth decay, heartburn, liver problems, sore throat, ulcers, and arthritis. Many of these uses still apply today. The National Institutes of Health notes that licorice is used for a variety of digestive problems, including stomach ulcers, heartburn, colic, and chronic gastritis. The University of Maryland Medical Center notes there is mixed evidence about whether it works for stomach ulcers, but a few studies have found that a certain type of licorice called “deglycyrrhizinated” licorice, along with antacids, helped treat ulcers. Other current uses include canker sores—a small study showed that people who gargled four times a day with licorice dissolved in warm water experienced pain relief—indigestion and GERD, upper respiratory infections, and depression. Some small studies have indicated that licorice root extract may suppress the viral activity of the herpes simplex virus, which causes cold sores. Though considered mostly safe, people who consume large amounts of licorice for more than four weeks (30 grams or more daily) can experience side effects like headaches, high blood pressure, low blood potassium, weakness, and paralysis. Those who have heart disease or kidney disease are more at risk for these effects. Licorice root has a good reputation as being helpful for sensitive skin. Licorice root contains an active compound called “glabridin.” Licorice extract may also help diminish the appearance of dark under-eye circles, discoloration and age spots. The extract also has powerful antioxidants that help protect the skin from environmental stressors, as well as “licochalcone,” which helps balance oil, making this a good ingredient for those with oily skin. We use licorice root in the following products for all its healthy skin properties. How do you use licorice? Please share any tips you may have. “Licorice,” University of Maryland Medical Center, http://www.umm.edu/altmed/articles/licorice-000262.htm. “Licorice—Treats more than a sweet tooth,” Truth in Aging, October 27, 2009, http://www.truthinaging.com/ingredient-spotlight/licorice-treats-more-than-a-sweet-tooth. Take 1 teaspoon of licorice and 1 teaspoon of besan and 1 teaspoon of wheat flour and add milk to make a paste and apply it for 20 minutes by applying it for 10 days you will see a great result. It may work, but typically these extracts are in something like aloe or glycerin. How long it takes to lighten skin depends on your skin and what you’re working with. I would suggest working with an esthetician to see if they can help you out with your skin care goals. Means I should blend licorice extract with either aloe Vera gel or glycerin. I have eczema and psoriasis and the only thing I use is the Made From Earth Valencia Orange Lotion – no eczema or psoriasis all month since I have been using it. Leaves my skin feeling smooth and soft without feeling greasy or heavy on my skin. That depends on what you’re working with. Real healing does take time and a singular skin cell does live for a month on average so if you’re healing scars that are in the deeper layers of the skin, it could take some time to see a difference in your skin. The negative effects of internal use of licorice root extract concern me–the high blood pressure and low potassium, headaches, and paralysis that can result. How can we be sure using this topically won’t cause the same effects, seeing as how the skin absorbs what you put on it into the bloodstream? This is a great question. You’re right, an extract of licorice root (specifically an alcohol extraction) used for a long period of time does have some pretty serious contraindications. However, if you’re using the oil or aqueous extract topically in such small amounts like in our skin care, it will not have the same internal effects. I hope that helps answer your question! How do you apply/use liquorice root? Can I just chew on it? Will licorice help with hypopigmentation too? I add licorice root powder to my oatmeal face wash. Love it! @Gloria….sorry to hear of your ailment. Try any vitamin store (vitamin Shoppe, gnc) or whole foods grocery store. I am current looking to purchase liquorice root for my hyper-pigmentation as well,did where you purchase it from and is it better to purchase liquorice root myself , boil it and use it directly? I purchased licorice extract and applied it every night and day to my skin. After two months I have noticed a significant improvement in the appearance of my skin. Dark hyper-pigmented spots are definitely lighter. I’m so happy that my face is reaching an even tone once again. Wonderful news Alexis, thank you so much fro sharing your success. You must be delighted. Make it a wonder-filled day.